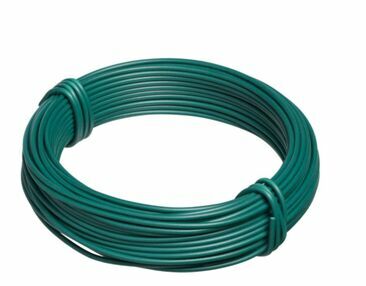 Product categories of PVC Coated Wire, we are specialized manufacturers from China, Green Pvc Coated Wire, Pvc Coated Iron Wire suppliers/factory, wholesale high-quality products of Durable Pvc Coated Wire R & D and manufacturing, we have the perfect after-sales service and technical support. Look forward to your cooperation! PVC Coated Wire (hereinafter referred to as: plastic coated wire) Galvanized Wire do the product selection of quality raw materials, through deep processing to make plastic and galvanized iron wire tightly together, has anti-aging, corrosion resistance, anti cracking characteristics, service life is cold and hot galvanized iron wire several times, the product varieties and colors. electric galvanizing, hot-dipped galvanizing, PVC spraying and PVC coating. Used in the construction of chain link fences for industrial security fences, freeways and tennis courts, also used in other applications such as coat hangers and handles, etc. Common colors available for PVC coated wire are green and black. Other colors are also available on request. *Related Products:Pvc Coated Wire Mesh Fence,Pvc Coated Chain Link Fence.